Our State's wetland resources are abundant and diverse. From marshes to wooded swamps and bogs, from sedge meadows to peatlands and vernal pools, wetlands benefit Maine people in countless ways. They help prevent flooding by slowing down and absorbing water which might otherwise end up on our properties, or in our basements. Wetlands gradually release stored water to rivers and streams to maintain flow throughout the summer, and recharge groundwater aquifers so our wells do not go dry. They protect our shorelines from erosion by absorbing the shock of wave action, and preserve water quality by retaining sediment, nutrients and other pollutants. But wetlands do not exist only to serve our needs. They provide critical habitat for a myriad of species that form a delicate and complex web of life. Frogs, salamanders, turtles, fish, insects, songbirds, waterfowl, deer, and moose are just some of the creatures that depend on wetlands for food, shelter and/or breeding habitat. No wonder so many outdoor enthusiasts have a favorite wetland spot to hunt, fish, hike, canoe, or simply to enjoy Maine's beauty. For more information about wetland functions and values, you may want to visit the US Environmental Protection Agency's Wetland page. Invasive species. For information about what invasive plants are, how they are transported, relevant laws, and other information see the Maine DEP Invasive Aquatic Species Program, the Maine Natural Areas Program, and/or the Lake Stewards of Maine. Links. Agencies, organizations, volunteer information, educational resources, and technical guidance and reports. Monitoring and assessment. 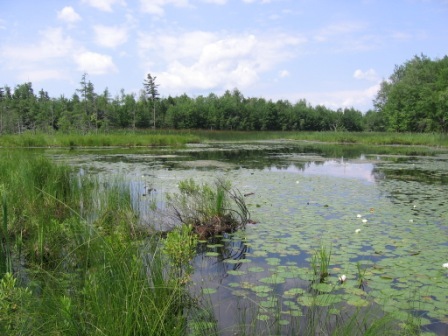 Monitoring and assessment of Maine wetlands is done by the Biological Monitoring Program. Threats to wetlands. How wetlands in Maine are threatened and what you can do to help. Types of wetlands and wetlands life. Discussion of the major types of wetlands in Maine and their flora and fauna. For questions about monitoring and assessment of wetlands in Maine, please contact Jeanne DiFranco or Beth Connors in the Division of Environmental Assessment, Biological Monitoring Program. For questions about landuse activities in or near wetlands, visit the Natural Resources Protection Act webpage.